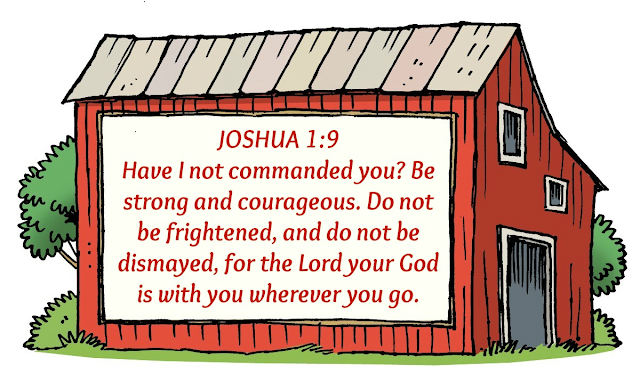 I don't have a "Word of the Week" for you today, but I wanted to share the theme verse for our church's Vacation Bible School for this year - Joshua 1:9, as seen above. J. Hampton Keathley III writes: God was calling Joshua into a "very special and difficult ministry, one with tremendous challenges and obstacles far beyond his own skill or abilities. But life for all of us is filled with such challenges so let us not pass over this without seeing the personal application this can have for each of us. In other words, this verse was written for Joshua, but it can be applied to us all. So, let this be your focus and encouragement this week, as a reminder that, no matter what difficulties you face, you can trust in the Lord for his strength, courage, and provision. By the way, our VBS starts tomorrow morning, and the theme of the week is Cowabunga Farm: Growin' With Our Faithful God. The kids will experience life on the farm while learning about God's faithfulness as revealed in the life of Joseph.